Meeting Cathy (musician Paul Shaffer’s wife) and her family in Korea Town. 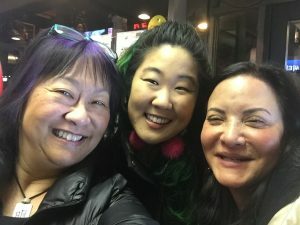 She turned and said, “You’re an honorary Korean tonight since most of us are Korean even though you’re Chinese.” Loved it as I’m in Korea Town quite often. We went to New Wonjo. Cathy wanted me to meet this young talented saxophonist Grace Kelly. What a name to have because I thought of the amazing actress of that same name. Most people under the age of 45 wouldn’t know who she was. Grace is so full of energy and talent and she will be performing at Joe’s Pub on April 18th. Check her out: http://www.gracekellymusic.com. Meanwhile, the food was so tasty and I was eating like it was my last meal, I wish I had some now! Grace, Cathy and I took a little selfie after the dinner. Thanks Cathy for the dinner invite and introducing me to some of your family and friends.